Diffusion is the spreading out of particles in a gas or liquid. There is a net movement of particles from areas of high concentration to areas of low concentration until a uniform concentration is achieved. 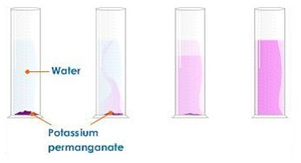 Dissolving potassium manganate(VII) in water demonstrates that the diffusion in liquids is very slow because there are only small gaps between the liquid particles into which other particles diffuse. The random motion of particles cause the purple colour to eventually be evenly spread out throughout the water. Adding more water to the solution causes the potassium manganate(VII) particles to spread out further apart therefore the solutions becomes less purple. This is called dilution. When ammonia gas and hydrogen chloride gas mix, they react together to form a white solid called ammonium chloride. A cotton wool pad was soaked in ammonia solution and another was soaked in hydrogen chloride solution. The two pads were then put into opposite ends of a dry glass tube at the same time. The white ring of ammonium chloride forms closer to the hydrochloric acid end because ammonia particles are lighter than hydrogen chloride particles and therefore travel faster. Even though these particles travel at several hundred metres per second, it takes about 5 min for the ring to form. This is because the particles move in random directions and will collide with air particles in the tube.